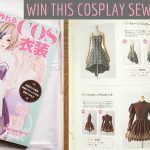 This month when I was doing some pinning on my Halloween Pinterest board, I stumbled upon an awesome Japanese website full of free costume sewing patterns. The website is called DR-Cos, and it’s a Cosplay website where you can find costume sewing patterns to dress up as a ninja, nurse, maid, cheerleader, vampire, the list goes on and on! All theses sewing patterns are free to download. The only thing is, they are all in Japanese! 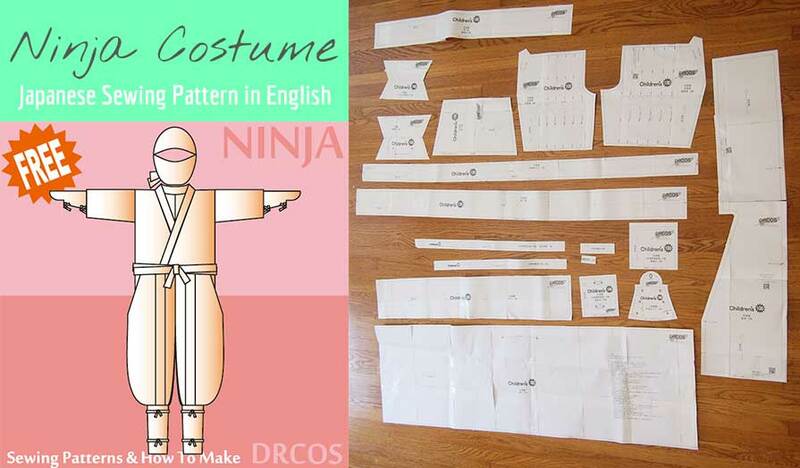 So first up, I’ve translated this free Ninja sewing pattern. It’s a great pattern because it includes all the “official” components of Ninja attire, such as the hood, hand guards and shin guards. The outfit also comes with authentic Hakama pants, which is are pleated formal pants with a waist tie, worn traditionally by men only. DR-Cos has an English website as well, but the patterns are still all in Japanese. If you guys have a design you’d really like to be translated, please let me know by leaving a comment below. The free Ninja sewing pattern has been translated into English over on my other blog, Japanese Sewing Patterns. Rin is the founder of Sew in Love, where she helps busy women live a creative, meaningful life. She also designs minimalist sewing patterns at HanaPatterns.com. She loves food from her Japanese heritage, cups of tea and hanging out with her Aussie husband and two girls. DIY Cocoon Dress – Free Sewing Pattern Review + Baby girl is here! I had a look at the website, but i dont know where the other patterns are as i cant find my way around. But thanks so much for translating this one! So glad you like it. I’m trying to make this costume and an struggling a bit. could you post pictures of the bodice, collar and sleeve part that is in part 4. i think they are missing but youreferenced them. Also, are the pants suppose to be short? I cut out the pattern and the pants look like a pair of shorts. how do the shin guards fit with the pants? Thanks. Thanks so much for coming back here to comment. It looks like I totally forgo to upload the image for the bodice, collar etc. I’ve updated that now, so please take a look at Part 4 again. Sorry about that! No, the pants aren’t supposed to be shorts, but they do tuck in to the shin guards so I am thinking the shin guards make up the extra length if your printed version looks too short. There’s an image in the blog post which shows you how to use the shin guards. I hope this helps. Thanks again for your message! I help creative women live a more beautiful and meaningful life. I’m passionate about sewing, crafts, and sustainable living. Let’s start creating! 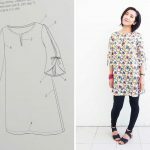 Tunic Dress: Is this the best Japanese sewing pattern maker? Sign up to my newsletter to get sewing patterns and other creative resources in my FREE creative resources library. Start making beautiful things today! Your information will never be shared or sold to a 3rd party. Unsubscribe at any time.